So many hamantaschen. Definitely more than last year. From back left: chocolate apricot, chocolate raspberry, apricot (my boyfriend’s family recipe), raspberry (also his), apricot (my family’s recipe), chocolate chips, spinach feta, and mushroom sage. It snowed again in DC, can you believe it? This most recent storm is prompting social media users to call today Snow Patrick’s Day! Hopefully anyone planning to go out for tonight’s shamrock festivities will still be able to do so safely—of course, were we in the Midwest, this wouldn’t be an issue. Where there’s a will, there’s a way—for green beer. Fortunately, my friends and I celebrated St. Patrick’s Day on Saturday, so we are all set. 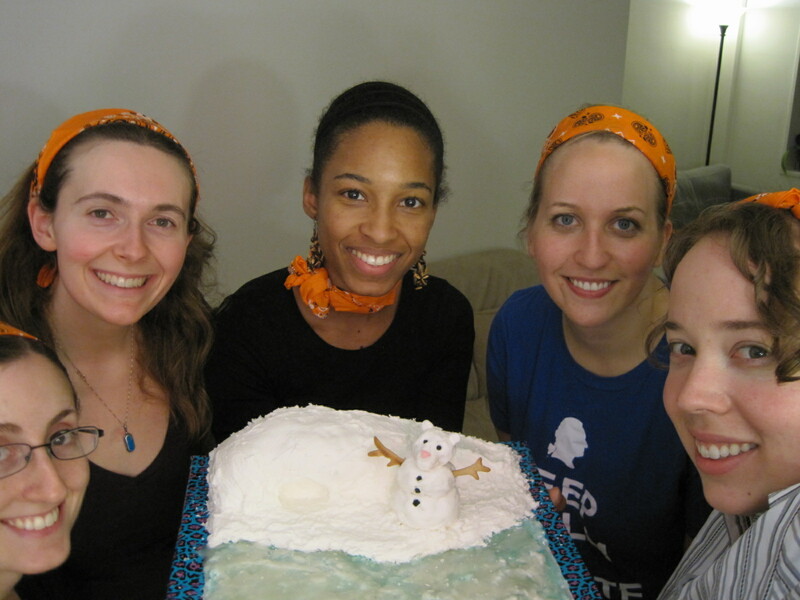 It wasn’t the only festivity we celebrated, and in fact was kind of the afterthought holiday. Saturday night was the Jewish holiday of Purim. As a one-sentence refresher on this story celebrating religious freedom: Persian King Ahasuerus replaces his queen, Vashti, with Esther, who is secretly Jewish, the king’s evil Jafar-like advisor Haman decides to kill all of the Jews, Esther’s wise uncle Mordecai encourages her to appeal to the king for help, Esther saves the day. Visit last year’s Purim post for more details! Both involve spending time with family and friends, drinking a lot, and eating tasty treats. 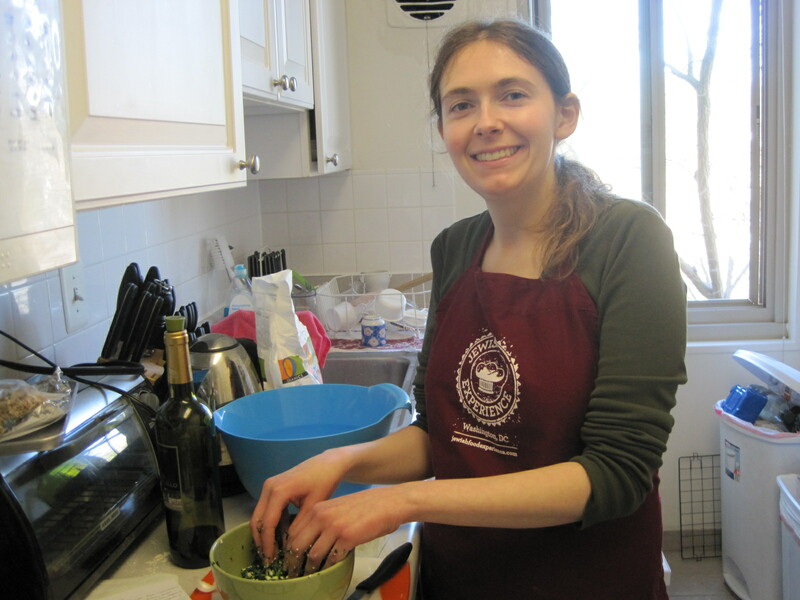 Meshing green foods for St. Patrick’s Day with hamantaschen cookies for Purim presented a new challenge. 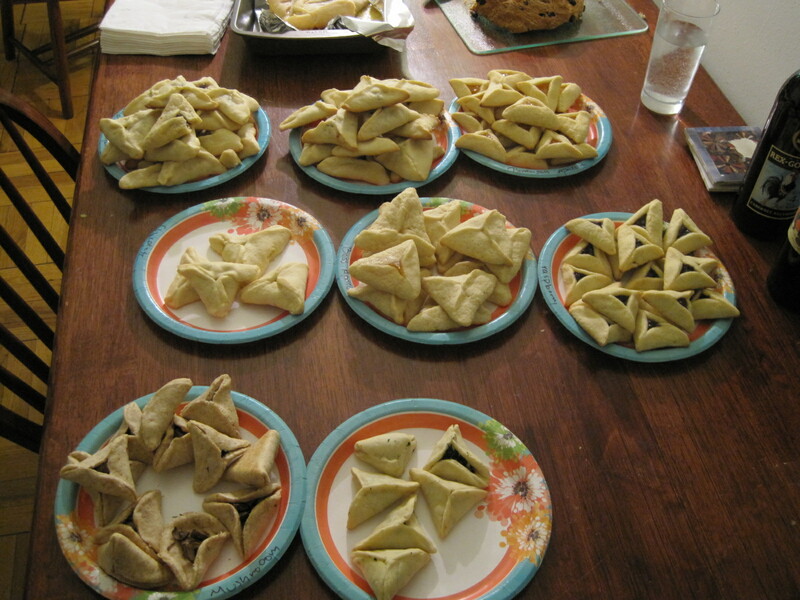 Last year, as you may recall, we made over 100 apricot, raspberry, and chocolate hamantaschen. This year, we decided to take things up a notch by baking savory hamantschen. Seems innovative, yes? Think again. Doughy pockets filled with vegetables, meat, cheeses, and spices are nothing revolutionary. People worldwide have made them in various forms since ancient times. Chinese wantons, Korean dumplings, Turkish borekitas, Ethiopian sambusas, Spanish/Latin American empanadas, Polish pierogi, Italian ravioli, Greek spanakopita, and Middle Eastern borekas are just a few! Savory hamantaschen have become increasingly popular over the past few years, especially in Israel. The Jewish state is home to Jews from across the globe, and their culinary traditions manifest themselves in Israel’s bakeries and street vendors, and restaurants. And even The New York Times is paying attention! 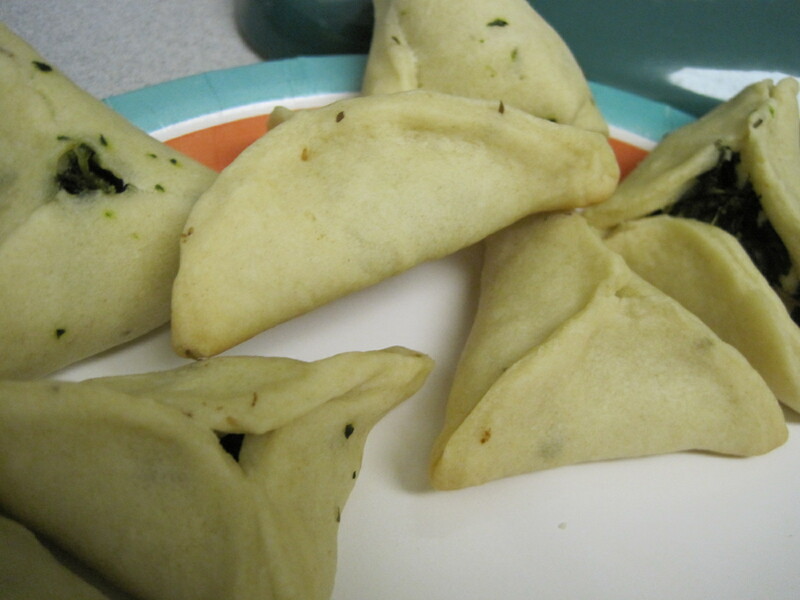 I used a Mediterranean spinach feta pie as an inspiration for making my green hamantaschen. I even took a look at historic recipe like this one from The Milwaukee Sentinel! Spinach pie, sometimes known as spanakopita in Greece, is much newer than you’d think. I’m sorry to destroy any preconceived notions, but ancient Greeks did not eat them. While they had plenty of vegetable dishes wrapped in pastry dough, spinach had not yet been introduced to the Mediterranean. Spinach, a fussy vegetable requiring a cool climate, originated in Persia—where the Purim story took place! 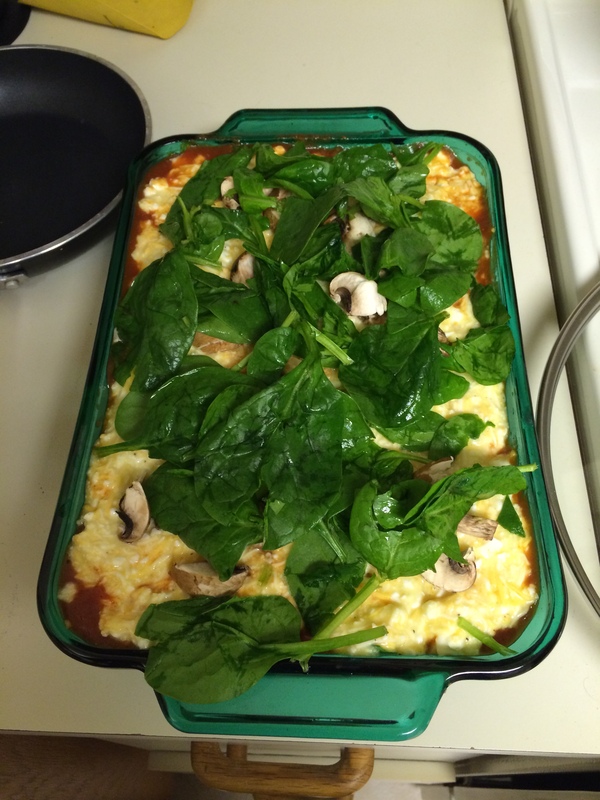 So maybe Esther, Mordecai, and even Haman ate spinach! In the 8th century, Arabs spreading out across the Mediterranean developed advanced irrigation systems that helped the temperamental leafy green withstand climate challenges. And so spinach finally became part of Greek cuisine! Marks, Gil. Olive Trees and Honey: A Treasury of Vegetarian Recipes from Jewish Communities Around the World. New Jersey: Wiley Publishing, Inc, 2005. We ran out of spinach hamantaschen first! 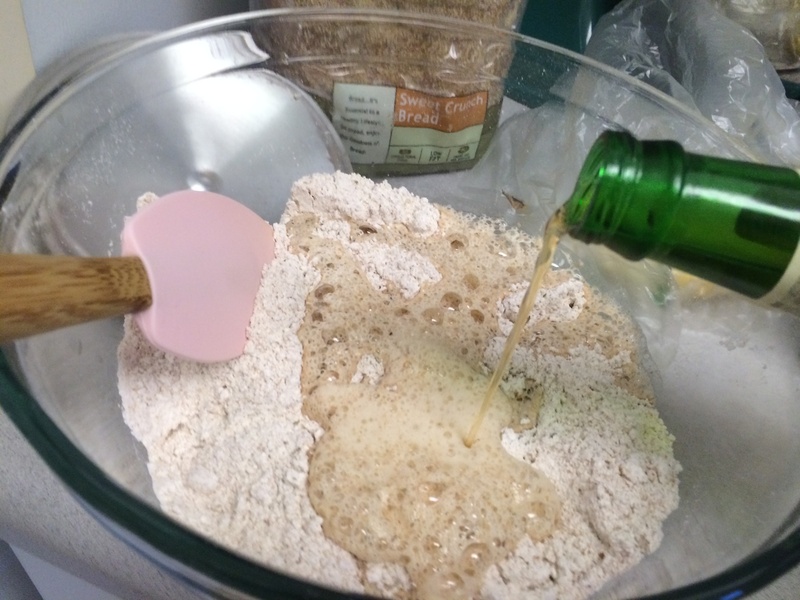 1) Mix top ingredients together to make dough. Allow to chill for at least an hour in the fridge. Dough ingredients ready for mixing! 2) Combine second group of ingredients to make filling. Feel free to experiment with additional spices if you wish. 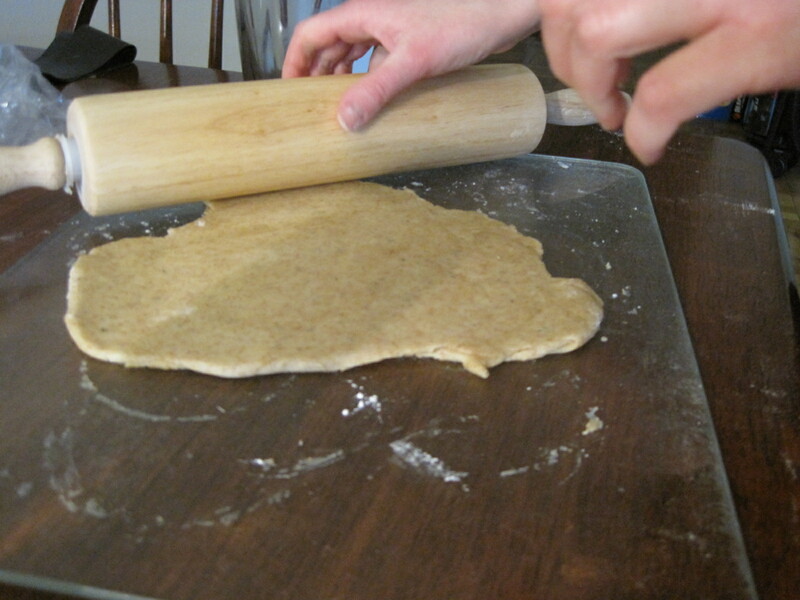 3) Roll out the dough as thinly as you can on a floured surface with a rolling pin. Use a wide-rimmed glass to cut the dough into circles. 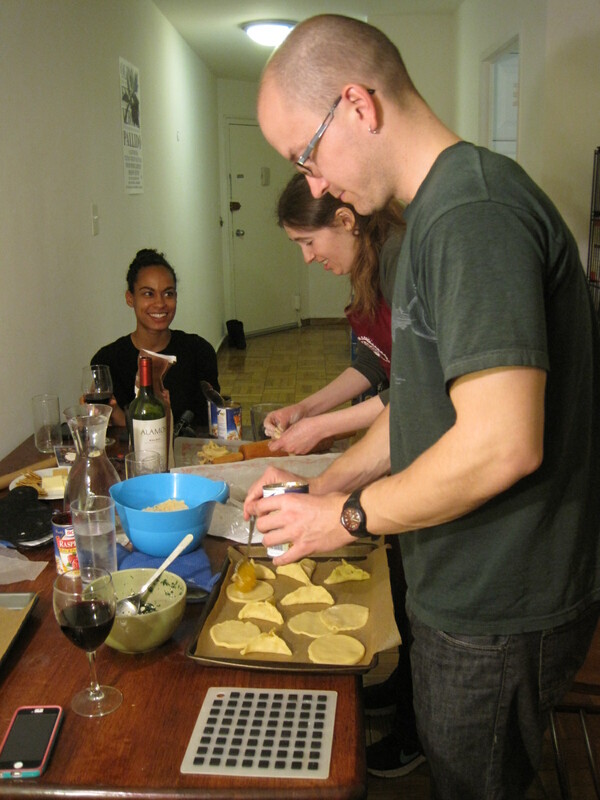 We made seven batches of hamantaschen that day. Rolling took forever! 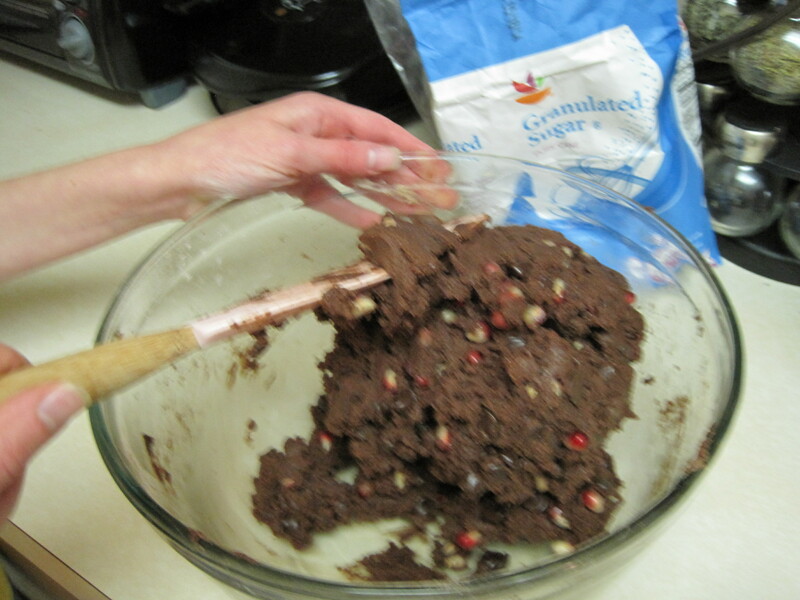 4) Fill the circles with a teaspoon or so of filling. Seal the pastry by folding the sides and pinching the corners to make a triangle. If dough does not stick, wet your fingertips with a little warm water to help seal. Fortunately I had lots of friends to help! Here are Maggie and Jake! 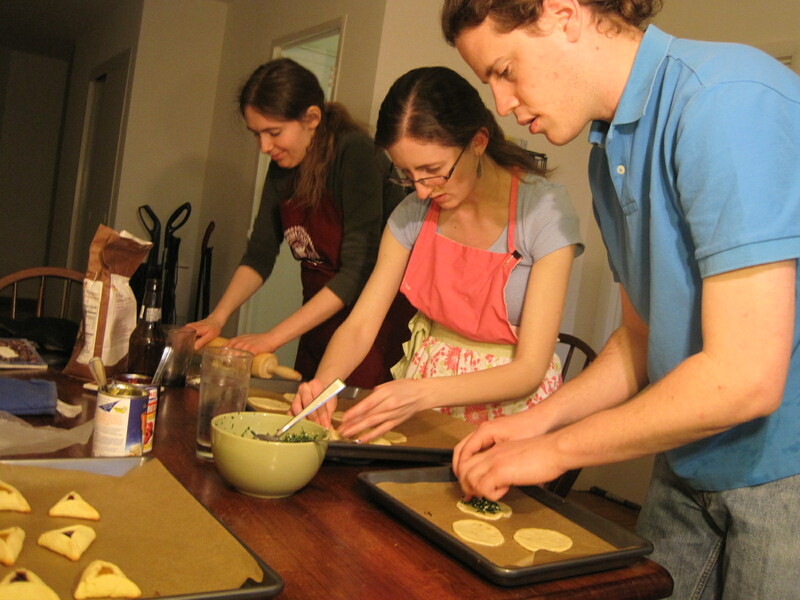 Danielle and Ryan turned out to be hamantaschen experts. Who knew? 5) Bake hamantaschen in a preheated 350 degree oven for 10-12 minutes, until the dough is cooked throughout and bottoms are golden. Happy Valentine’s Day, and Happy Snow Day to you lucky people out there! I’ve always loved Valentine’s Day, whether or not I was in a relationship. My mom always made delicious holiday treats, such as cupcakes, pink peppermint brownies, and chocolate-covered strawberries. Plus I bought Disney princess lollipop valentines for my friends and classmates…in fact, I still sometimes do this as an adult! As I mentioned on last year’s V-Day post, I hate most pink and fluffy things. 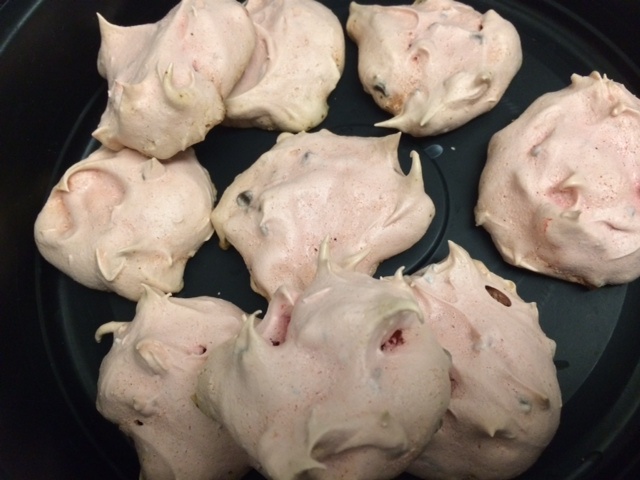 I’m delighted to share another exception to this rule, the meringue! Meringue is a dessert made from whipped egg whites and sugar. 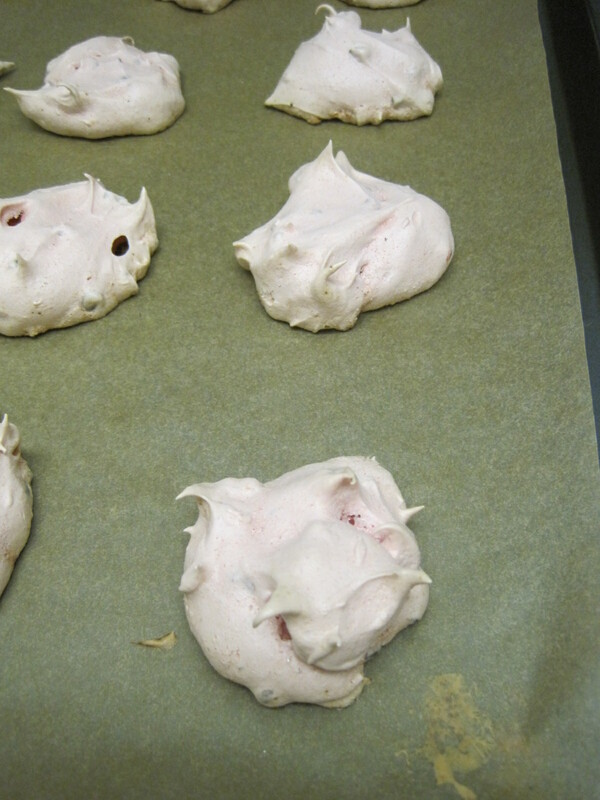 Sometimes extra binding agents, such as gelatin, cornstarch, and cream of tartar, are added to make the meringue less fragile. The mixture may be used as a cookie or a topping for cakes and pies (I’m still looking for that Rascal House lemon meringue pie recipe from Miami, if anyone has leads). Some historians trace meringue back to an 18th century Swiss chef named Gasparini, who lived in the town of Meiringen (now part of Germany). Others argue that the pastry was born in England—a country rarely known for its tasty cuisine. 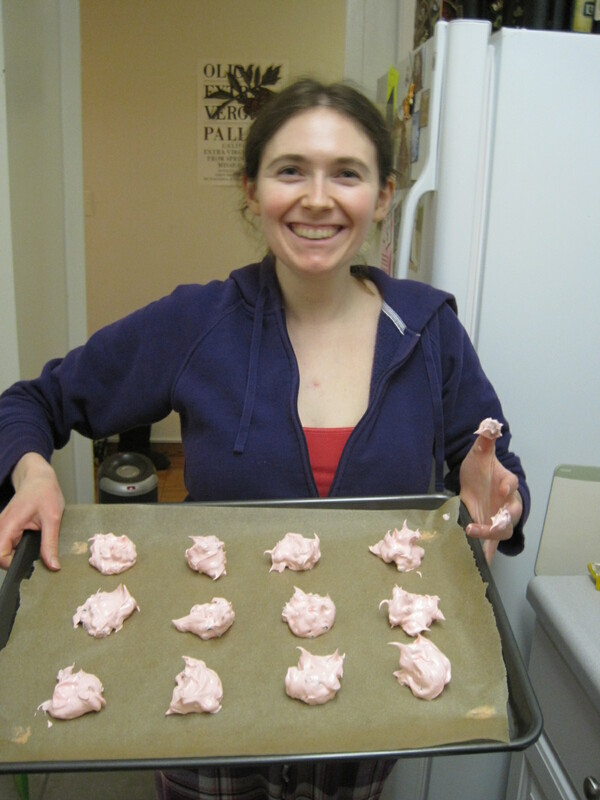 Lady Elinor Fettiplace penned what might have been the first recipe for meringue in 1604 in Oxfordshire. The treat was called white bisket bread, and was circulated in Fettiplace’s cookbook. One of the most famous meringue addicts was Marie Antoinette. As queen of France, Marie became notorious for throwing elaborate parties with elegant pastries and sweets. This frivolity of course ended in 1793 when she and her husband, King Louis XVI, were beheaded as part of the French Revolution. Even so, meringue remains at the center of many French dishes, savory and sweet. While the first meringues were shaped with a spoon, it was the French who switched over to elegant designs created by piping the whipped egg white through a pastry bag. 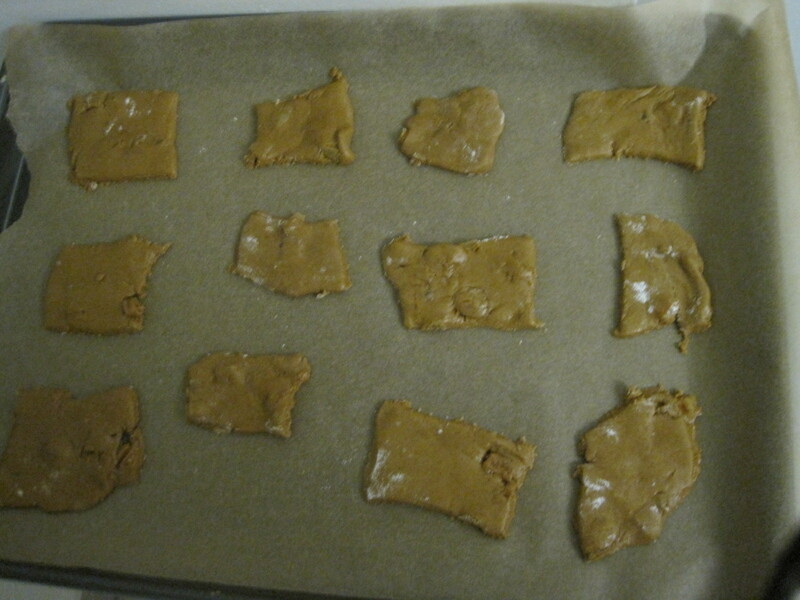 For today’s recipe, I’ve opted to go old-school and shape the cookies without a piping bag. Hope you (and your valentines) enjoy! Jackson, Linda and Jennifer Evans Gardner, Meringue. Utah: Gibbs Smith, 2012. My roommates devoured these at record speed! These cookies are great for parties, or just to eat with your friends! They also make terrific gifts if wrapped in a nice container. Just be sure not to over-pack as they are quite fragile. 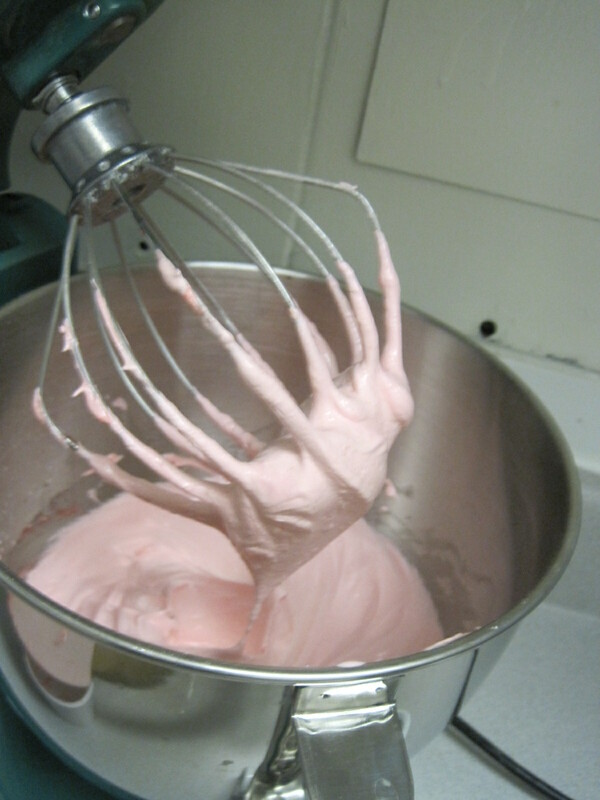 1) Whip egg whites in an electric mixer on high speed for 2 minutes or until foamy. I know these egg whites don’t look like much yet, but they will! 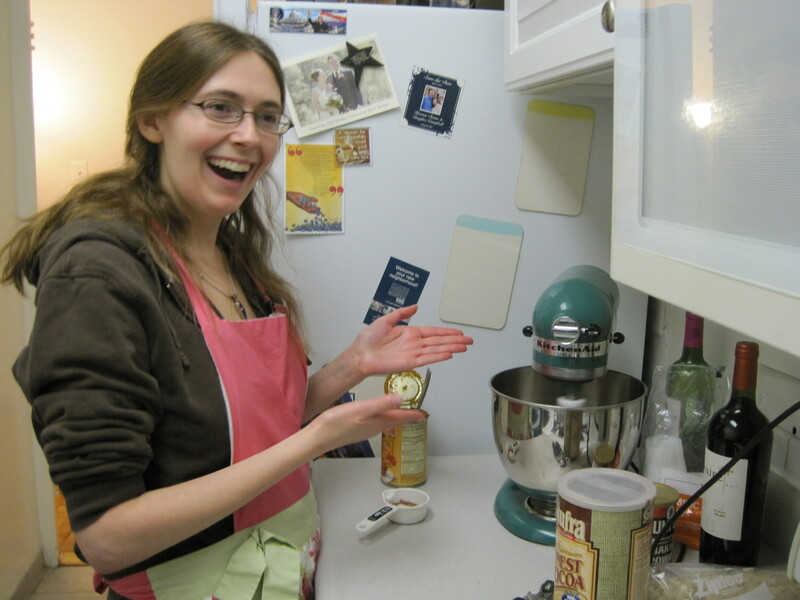 Minerva the mixer is my valentine (don’t tell my boyfriend)! 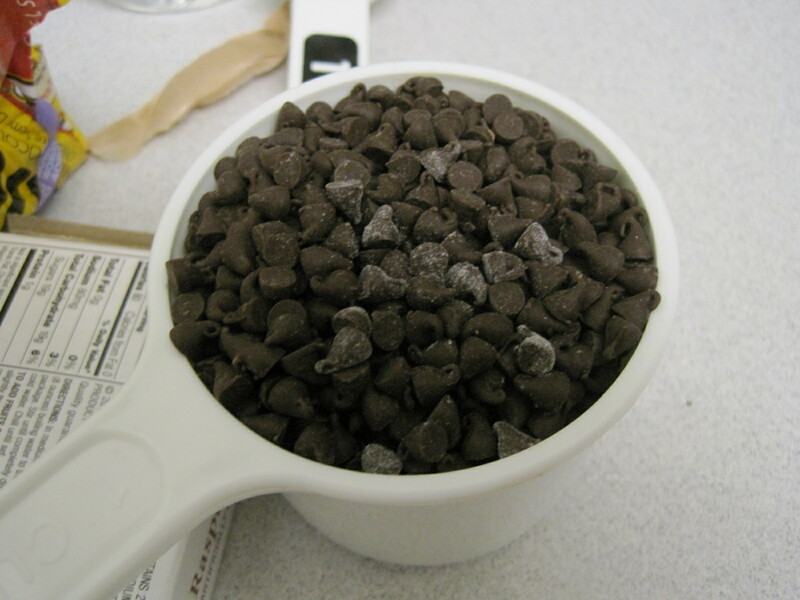 3) Pour in chocolate chips and vinegar. Whip for an additional minute. 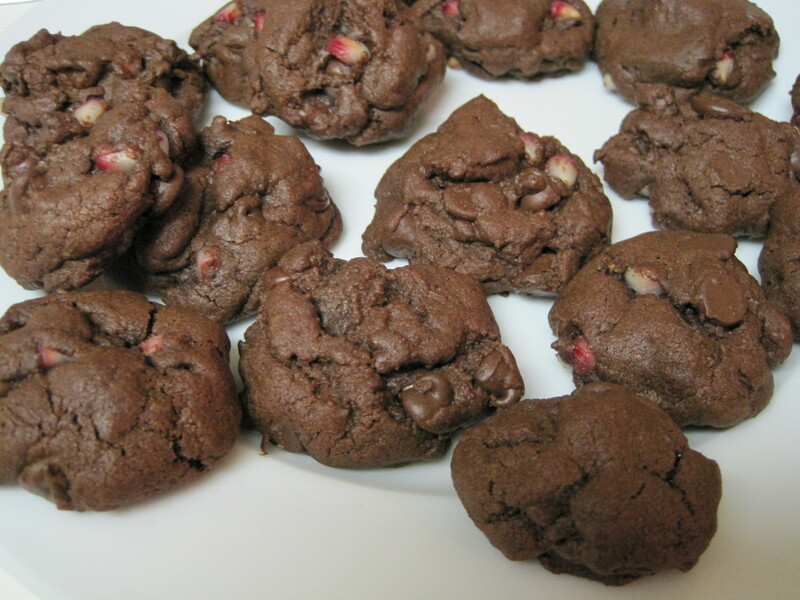 You could omit the chocolate chips to make these cookies fat-free…but why would you do that? 4) Drop batter by the spoonful onto parchment paper-lined cookie sheets. 5) Bake in a 350 degree oven for 20-25 minutes, no not allow to brown. We are ready to bake! 6) Once cooled, pack cookies in airtight containers for your valentine(s). As a Milwaukee native, I don’t think there is any way for me to NOT dedicate a post to beer. Ironically, I have hated beer for most of my adult life. I’m not a fan of the bitterness derived from hops, and generally prefer wine at social gatherings. Recently, however, I have at least grown to appreciate the brew for its exceptional applications in cooking and its fascinating history. Plus beer was one of the only true winners in last week’s unequivocally terrible Super Bowl (see this adorable commercial and you’ll understand why). You see, without beer, there would be no us. Originating in as early as 8000 B.C.E., it is among the most influential beverages on earth, perhaps only rivaled by water and tea. Historians cannot agree as to whether barley, one of the primary ingredients used to make beer, was first cultivated to eat or drink. They are in general agreement, however, that beer likely originated in the Middle East between the Euphrates and Tigris rivers. And by now it should come as no shock to you that ancient Egypt soon followed. Egyptians limited the consumption of beer (which was sweetened with honey, ginger, and date sugar) to royals. Ancient Greeks referred to beer as “barley wine,” and helped the drink spread across the region. Eventually beer made its way to early Europe, where it was consumed by men, women, and children alike. As evidenced by events such as the Black Plague, water was often contaminated and filled with harmful (and frankly downright disgusting) bacteria and illnesses. Beer, which required brewers to heat and ferment the liquid, removed many of these dangerous toxins. Brewing was primarily the responsibility of women, who took on the chore as part of their household duties. During the Middle Ages, monasteries were Europe’s brewing centers (hence names such as abbey and trappist). Beer was valued for its medicinal properties, sanitation (compared to the icky contaminated water), and overall cheer. Monks even developed special brews to help nourish them through lent and fasts! Equally important to beer were the taverns and social halls where the beverage was consumed. After all, it was in taverns that the great minds of the day could discuss new ideas and theories, conduct business transactions, and engage in political discourse. How beer arrived to America and transformed our social and political lives is another story, one which I will get back to in a later post. Long story short, beer got here with the pilgrims, survived prohibition, and gave birth to gigantic companies. Today, beer is more popular than ever in the United States. And it is not just Miller and Bud Light making ripples. Microbreweries, such as Sprecher (my hometown favorite that also makes fantastic root beer) and DC Brau use Old World methods to make their beer. At a recent conference at the D.C. Historical Society, I was delighted to hear about a new brew by DC Brau that seeks to replicate a lager by the Christian Heurich Brewing Company, the last brewery in Washington, DC (closed 1956). Local home brewer Mike Stein researched in the Smithsonian’s archives, looking up original Heurich receipts and documents to piece together Heurich’s lager. D.C. Brau just released the brew this past fall! And so, history lovers, drink up (but not so much that you can’t hold you book rightside up please)! 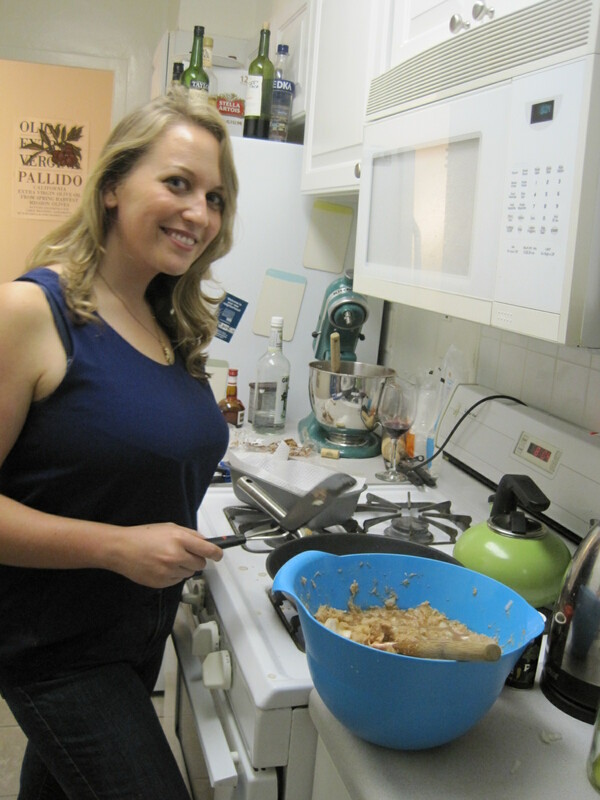 Or at least try cooking with beer and see what you think! Standage, Tom. A History of the World in 6 Glasses. Walker and Company, June 2005. 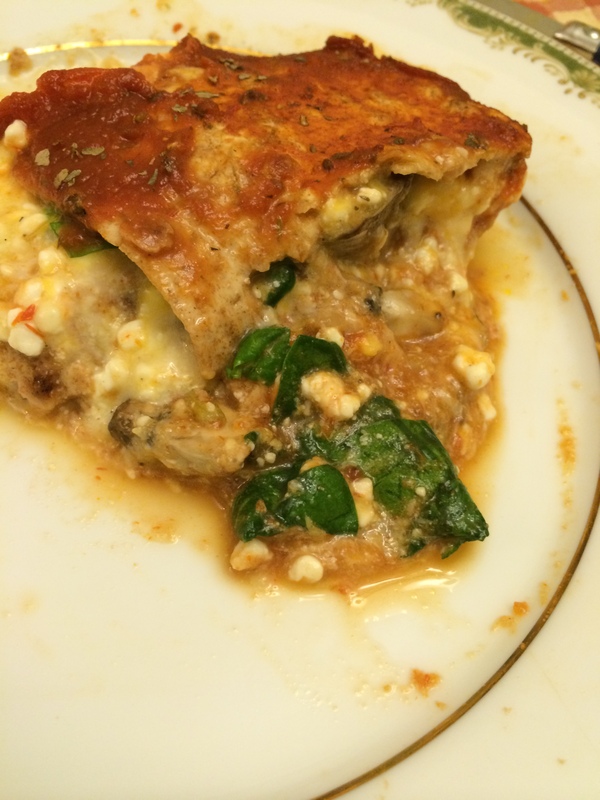 For those of you who hate complicated recipes, this is one of the most straightforward I have ever made. Danielle is excited. 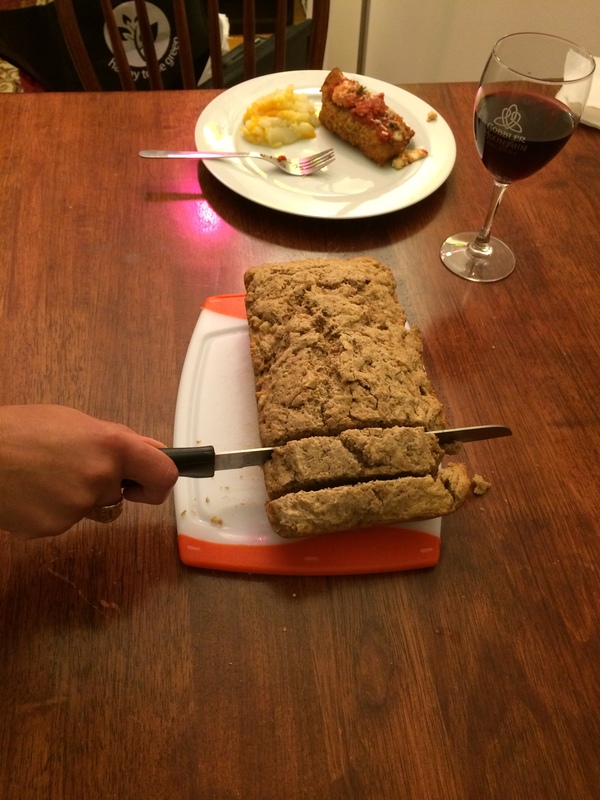 And doing an excellent job slicing bread-ironically the only time I constantly hurt myself! 3) In a large bowl, mix all tried ingredients and herbs. No yeast needed since it’s already in the beer! 5) Pour in loaf pan and bake for 45-55 minutes, until golden at top. 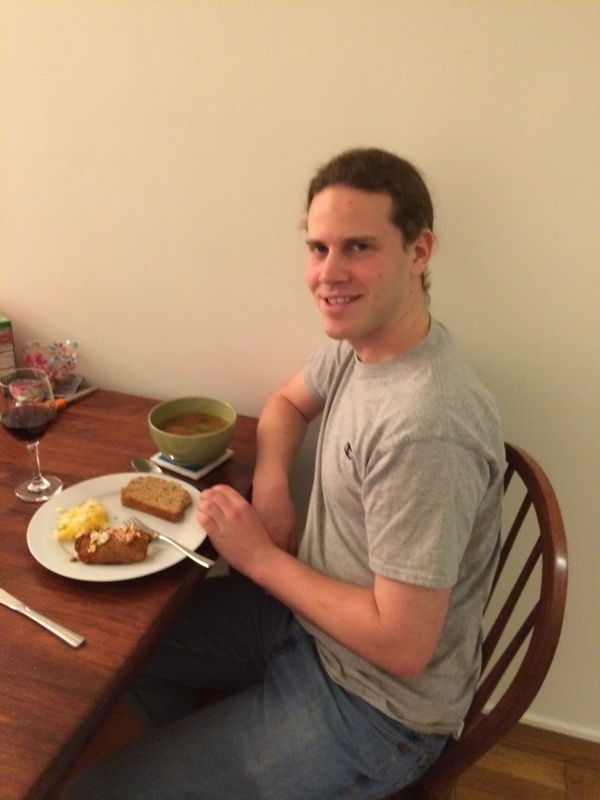 Our new roommate Jake is modeling our awesome snow day dinner: soup, beer bread, and eggplant roll-ups! Mmmm cookie! I don’t care what the new cookie monster says, C is for cookie! Happy New Year everyone! In many cultures, it is traditional to start off the year with “lucky” foods, including black-eyed peas (no, not the band), greens, and my favorite, pomegranates. Pomegranates are particularly significant in Judaism because it is believed that there are 613 seeds in each fruit, corresponding with the 613 commandments found in the Torah. I’ll confess that I counted the seeds in a pomegranate once…only came up with 369. If you have some extra time on your hands, you can try too! And if you do find 613 seeds, mazel tov! Coincidentally, today is also the Jewish “new year” of the trees known as Tu B’shevat. 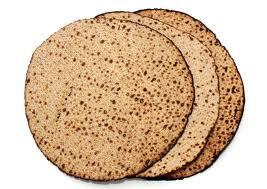 Some Jews celebrate this holiday by eating a meal of the “seven species” of Israel as described in the Torah: wheat, barley, grapes, figs, olives, dates, and pomegranates. Some families even have a festive Seder similar to Passover (fortunately sans matzah). Pomegranates are one of the oldest fruits in existence. They likely originated in the region from central Asia to Turkey, possibly in Iran. They have been cultivated for over 5000 years, first in the Middle East and then across the globe. In ancient times, pomegranate seeds were used as red dye for a variety of textiles and dishes. 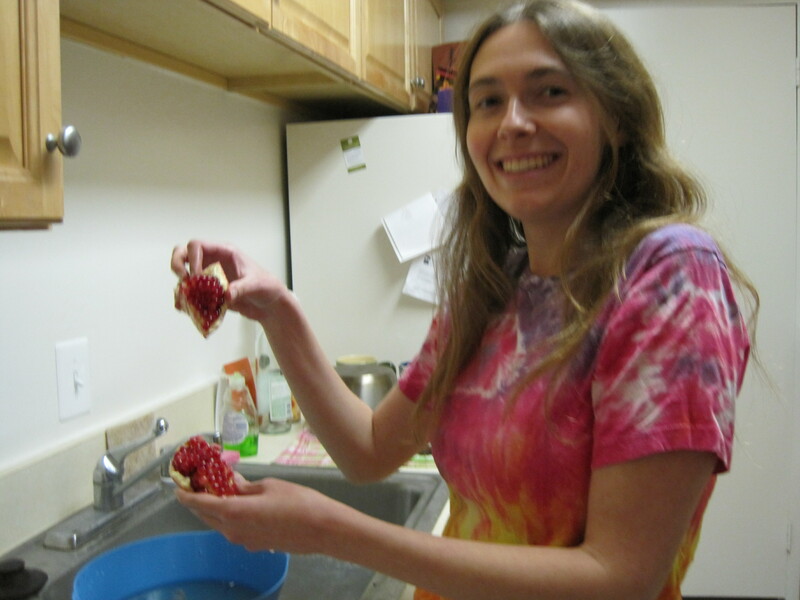 Even today, savvy home cooks know the risk of cutting open a pomegranate incorrectly. Burst a seed open and your clothes will be stained for good! 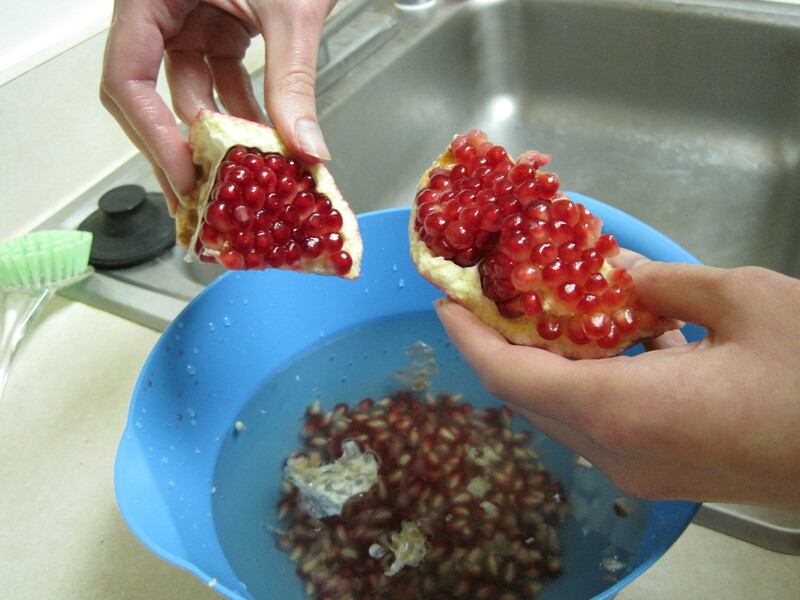 One of the easiest ways to de-seed a pomegranate is to cut in half and pull halves apart underwater. Don’t wear anything you love! Of course, those ancient Egyptians knew all about the pomegranate’s power as well. In addition to using the fruit’s juices to make medicine, the Egyptians also buried their pharaohs and nobility with pomegranates to ensure an afterlife. 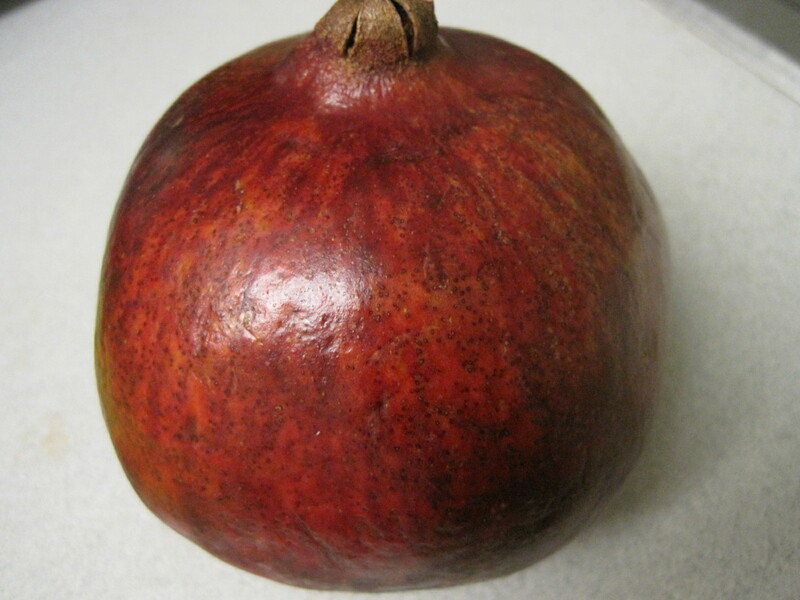 Pomegranates traveled down the Mediterranean and across Asia on the Silk Road, from 1600 B.C.E. onward. Crusaders in the 12th century C.E. brought pomegranates back from Palestine to their respective European homelands. Pomegranates were introduced to the new world after Hernan Cortes conquered the Aztecs. Jesuit priests brought pomegranates with them from Spain and cultivated the fruit in Mexico. Eventually pomegranates spread to California, where most North American pomegranates are grown today. Thanks to their high anti-oxidant content, pomegranates have become very popular in the United States and elsewhere, increasing the demand for this fruit. Its growing season ends in February, so get to a grocery store fast! This queen of the fruits even has a crown! Karp, David. “Pomegranates.” In The Oxford Companion to American Food and Drink, ed. Andrew Smith, 471. New York, Oxford University Press, 2007. Kumar, Mohnan. “Pomegranates.” In Fruits of Tropical and Subtropical Origin, ed. Steven Nagy, Philip Shaw, and Wilfred Wardowski, 328-347. Lake Alfred: Florida Science Source, 1990. 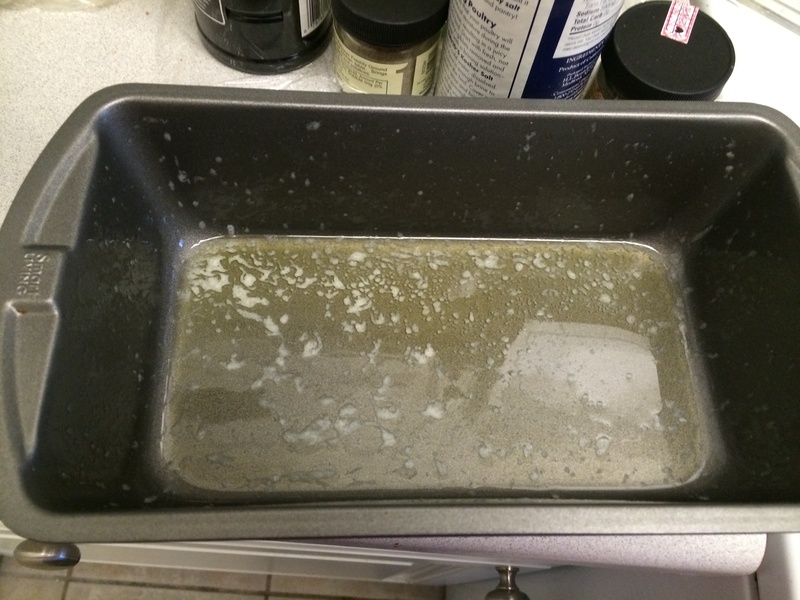 I opted to grease pans instead of using parchment paper as I was out. These cookies are delicious on their own, or served warm with ice cream. Also great for Valentine’s Day! 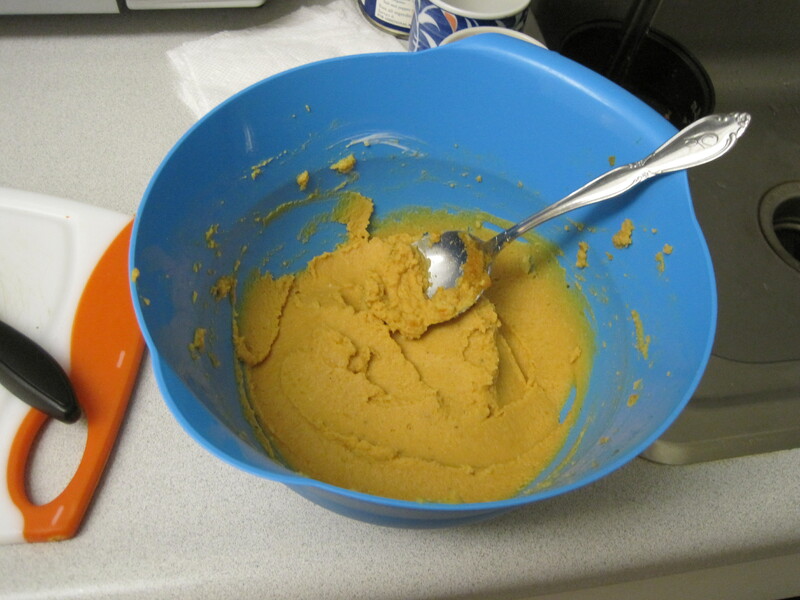 1) In a large bowl, cream butter, shortening, sugar, eggs, and vanilla. Tie-dye for Jewish Arbor Day! 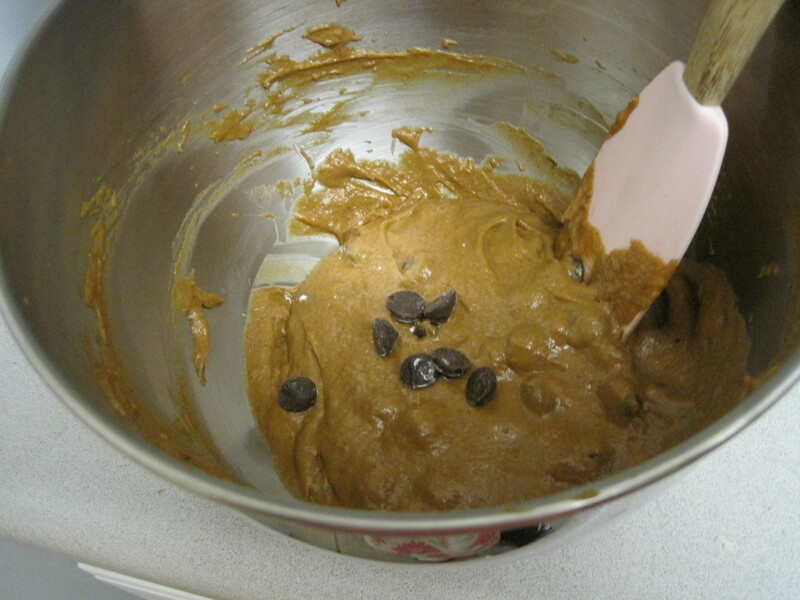 2) In another bowl, combine flour, cocoa powder, baking soda, and salt. 3) Slowly beat dry ingredients into wet ingredients. This makes lots of dough! 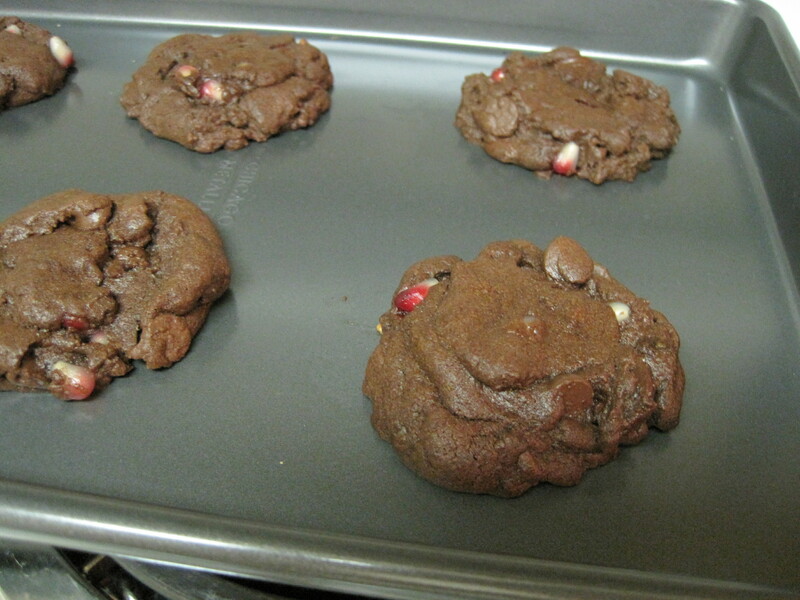 4) Mix in chocolate chips and pomegranate seeds. 5) Place rounded tablespoons of dough on parchment paper-lined cookie sheets. We are so excited! At least Maggie is! 6) Bake in a 350 degree oven for 9-10 minutes. 7) Top with ice cream and enjoy! Extra pomegranate seeds? They are delicious on their own, or sprinkled over salad or pasta. 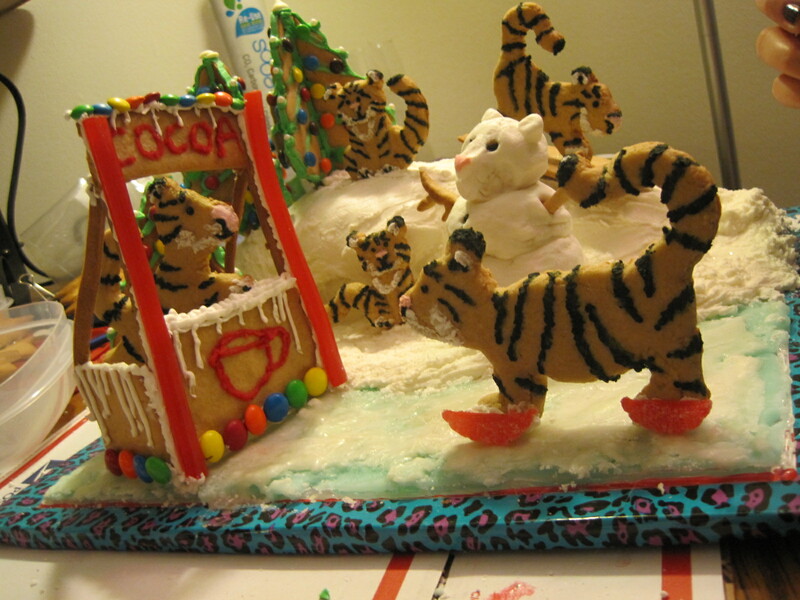 My friends and I entered the National Zoo’s gingerbread contest this year. Vote for our entry on the National Zoo’s facebook page now through December 31! Happy Holidays everyone! I have made it no secret that I am Jewish…but I love Christmas, especially in D.C. I love the lights, elaborately decorated trees, and of course, holiday treats. 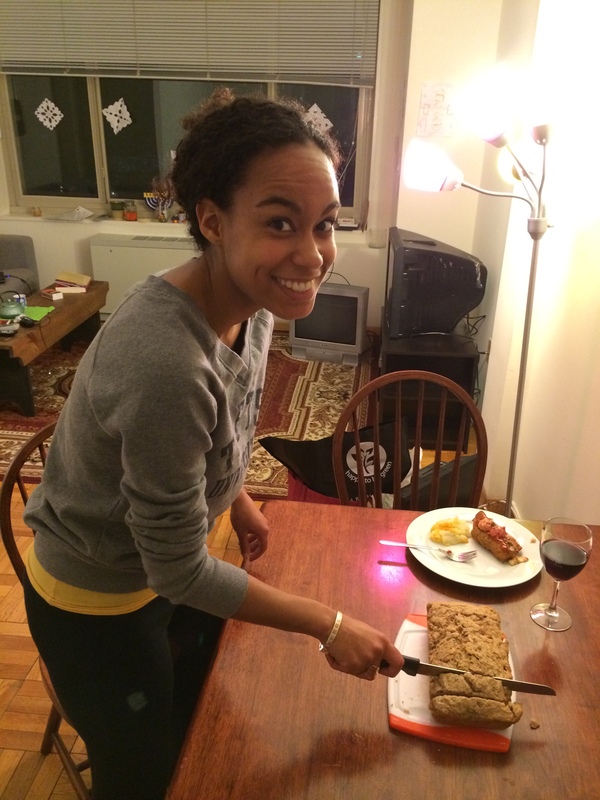 This year, I was lucky to attend some fabulous holiday parties hosted by my friends and colleagues. Eggnog, mulled wine, apple cider, cheese and fruit platters, candied cranberries, panettone, peppermint bark, spritz cookies, and one of my favorites, gingerbread. This spiced holiday snack is truly an international treat, and comes in all sorts of forms-as a cookie, cake, bar, and even as a house! And who doesn’t remember the gingerbread man? The team. We are Gin-GRR bread ninjas. It is important to note that not many of the cookies and cakes that we call “gingerbread” today actually contain ginger. Ginger originated in Asia, and was introduced to Europeans during the age of exploration. Crusaders during the eleventh century also helped the spice spread across the globe. Still, ginger was very expensive, and available only to the nobility and wealthy. Its addition to baked goods came much, much later. Gingerbread may be traced back to bakery in ancient Egypt, where Egyptians used added honey in an effort to both sweeten and preserve their cakes. Sound familiar? That’s right, this is the same story I told about honey cake earlier this year during the Jewish New Year, Rosh Hashanah. So gingerbread can totally be considered a Jewish food. Lebkuchen from my relatives in New Jersey. Thanks guys! In fact, I received a wonderful Hannukkah present in the mail from my aunt, uncle, and cousins in New Jersey- a batch of homemade lebkuchen and accompanying recipe. My aunt found lebkuchen in my Grandma Shirley’s 1970s cookbook! 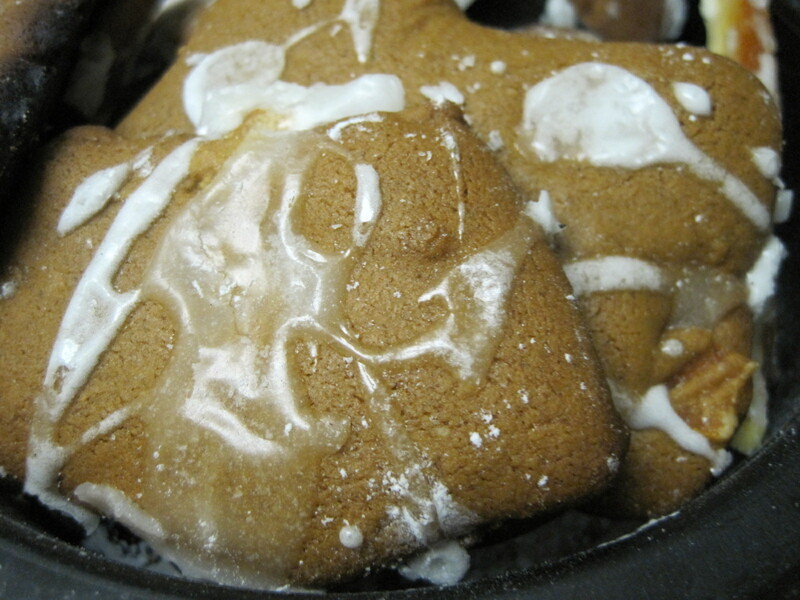 Lebkuchen is a German gingerbread cookie, often made with candied orange peel, almonds, or walnuts. Over the centuries, it has become a tradition for lovers to exchange heart-shaped lebkuchen as an expression of their affection. I guess I’ll have to remember that for Valentine’s Day. 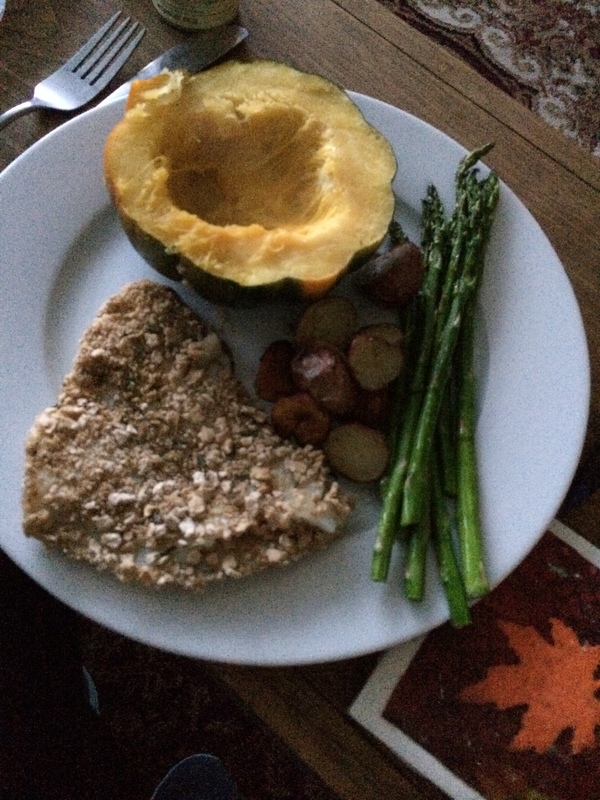 My family’s variation had nuts and a citrus glaze, and was absolutely delicious. Naturally, I had to try to make these tasty cookies too, with my own candied orange peel! The below recipe is what I came up with. Hope you enjoy! These lebkuchen cookies are perfect for dunking in tea, coffee, or hot cider. Your kitchen will smell really good for days. Score the skins of three naval oranges into quarters. Gently pull away the peel from the fruit, and cut peel into thin slices. 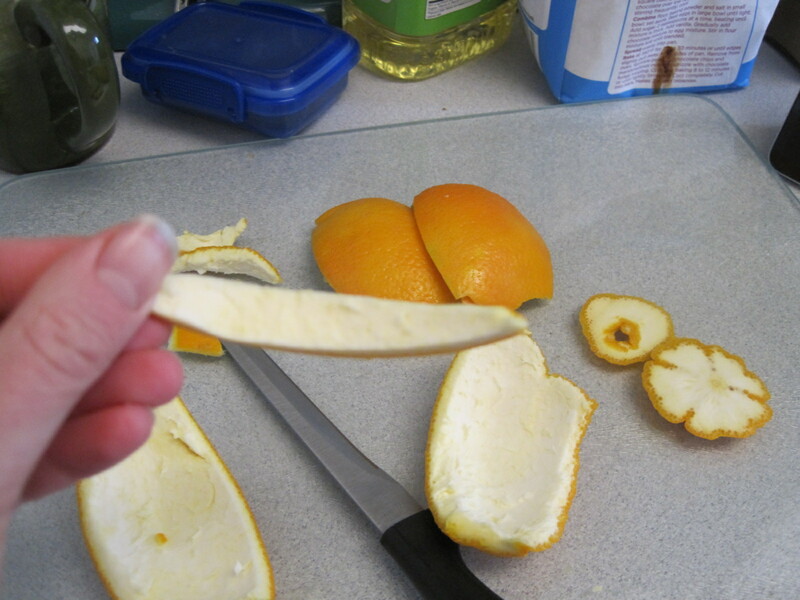 Place sliced peels in a put and cover with cold water. Bring to a boil. Drain slices. 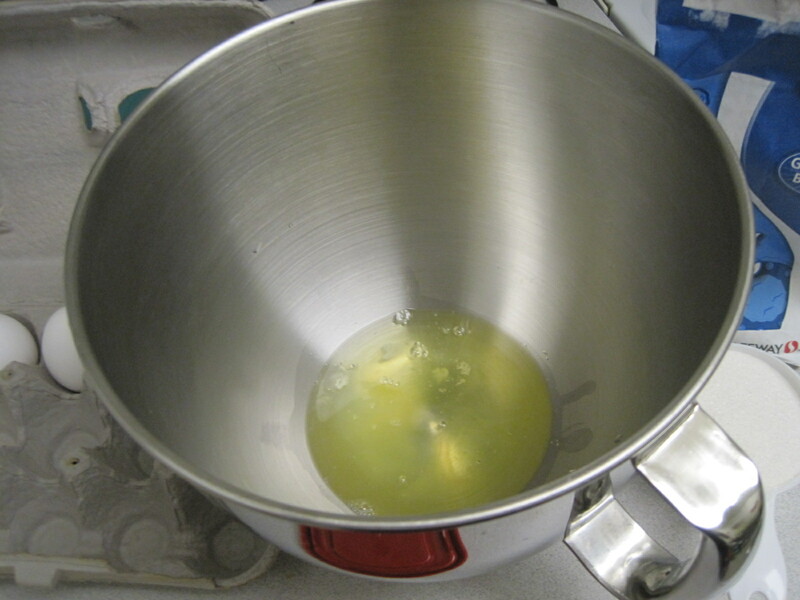 Cover with cold water again in pot and repeat twice (this is to remove the sour taste). Add orange peel slices and allow to simmer for about 45 minutes, until the peels are translucent. Do not mix with spatula as this will remove sugar crystals. Pour peels onto a lined cookie sheet to cool for 4 hours. Dice about 1/3 for this recipe, save the rest to eat as is or chocolate-coat later! 2) Sift flour, baking soda, and spices. Set aside in a large bowl. I made these during a snow day…I regret to report that this looked more like snow banks than the diminutive flakes we got in D.C.
3) Beat together brown sugar and egg. Add molasses, honey, and lemon juice. 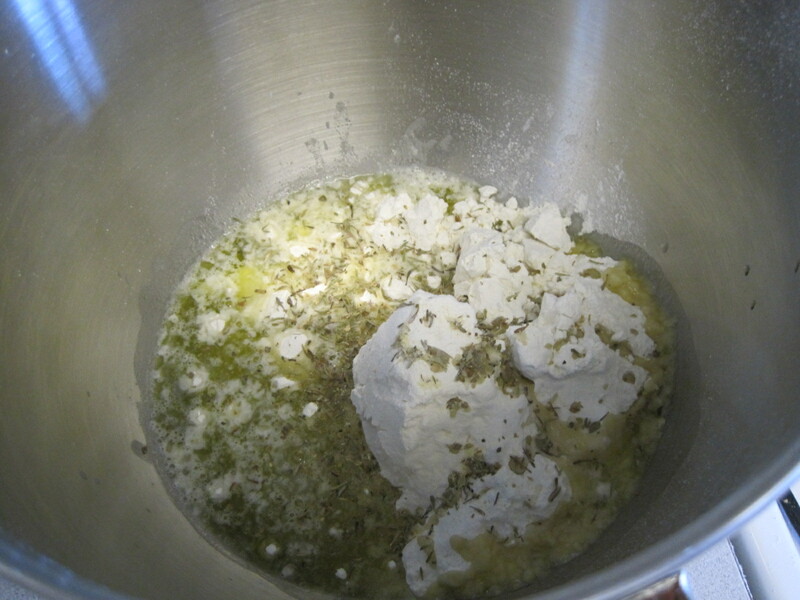 4) Slowly add dry ingredients. Stir in candied orange peel. 5) Knead the dough on a floured surface for 2 minutes. Split dough into two balls and place in plastic wrap. Chill for 3 hours or overnight. Surprisingly heavier than it looks! 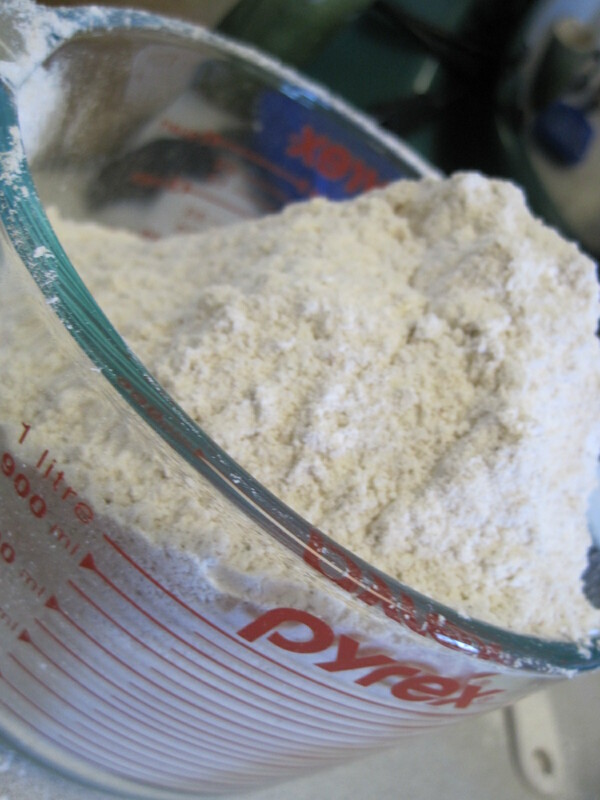 6) Roll dough on a well-floured surface, until it is ¼ thick. Cut into small rectangles or use a cookie cutter shape of your choice. 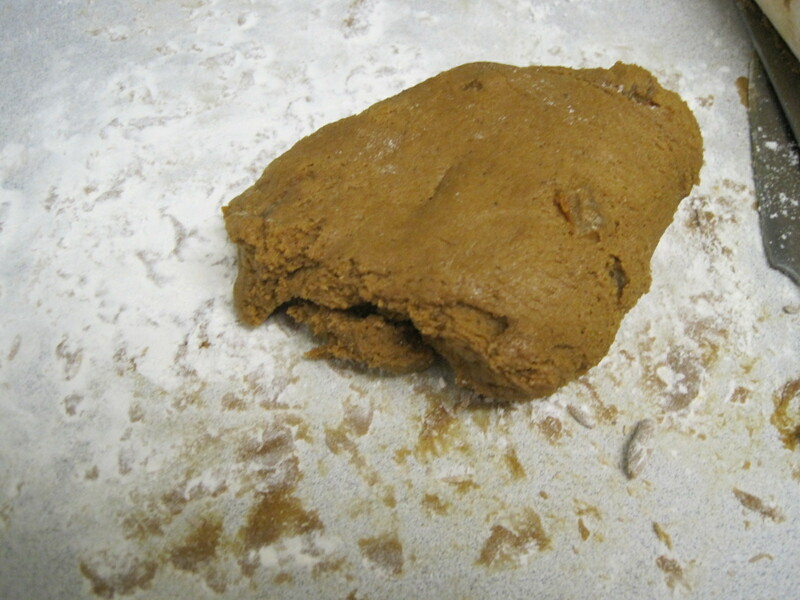 Traditional lebkuchen are often cut into rectangles prior to baking. 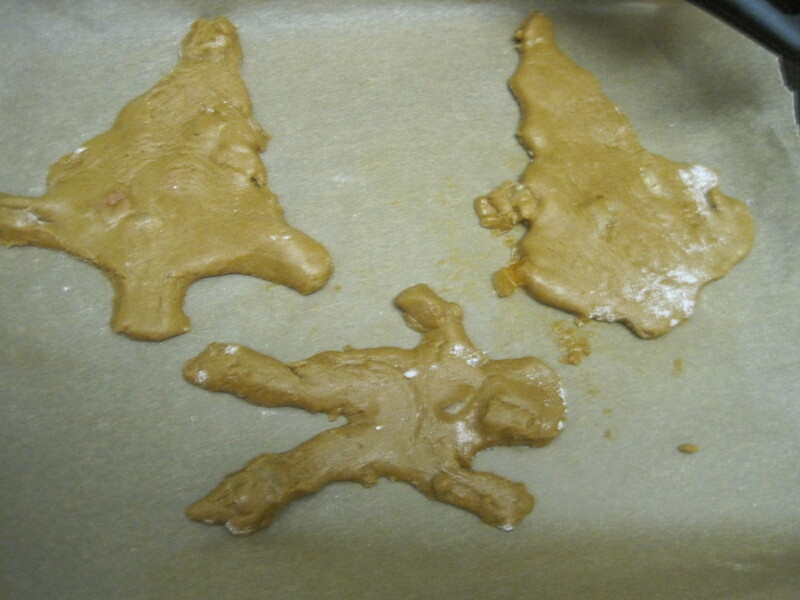 7) Bake at 350 degrees for 10-12 minutes or until cookies do no not leave imprint when pressed. 8) Make the glaze: Mix together powdered sugar, water, and lemon juice. *Tip: These cookies will be a bit crunchy after cooling. To keep them soft, store the cookies with a few extra pieces of candied ginger, or even a fresh apple slice. During our brief hiatus from blogging, we checked out the White House Garden. 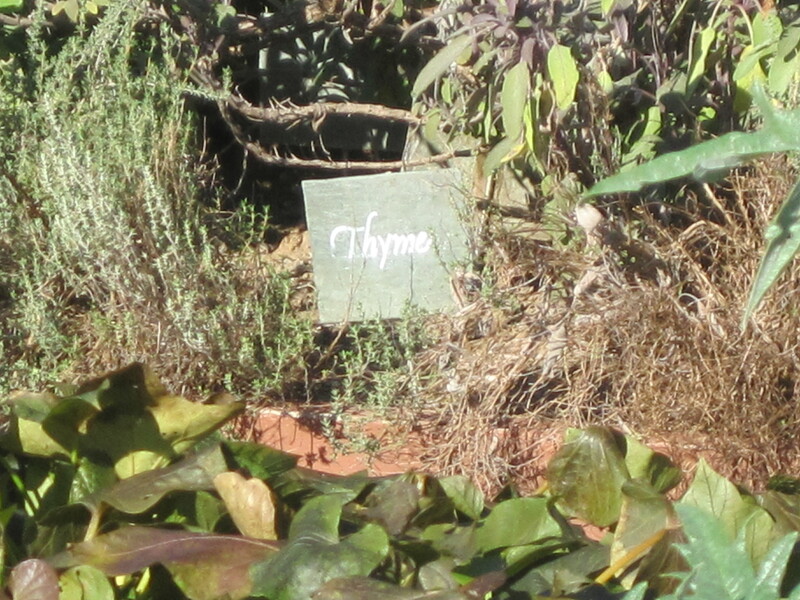 And you’ll never guess what herb Michelle Obama grows! Just when you thought things were getting too quiet over here! I apologize for our prolonged vacation, but for the past month my crew and I have been developing and testing new winter goodies, which we will share with you over the coming months! This holiday season is a bit goofy because tomorrow is both Thanksgiving and Hannukah, or as some prefer to call it, Thanksgivukkah. On top of that is my birthday…so here in my hometown in Wisconsin we are cooking and eating a lot over the next few days. 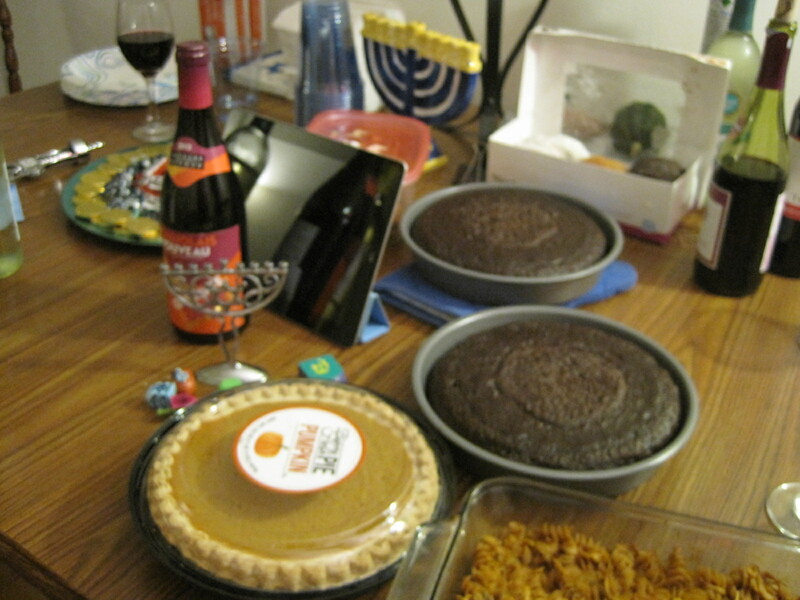 Pumpkin pie, kugel, and cranberry sauce made it to our Hannukah celebration this year. -Pumpkins are technically fruits since they have seeds. Nothing says Thanksgiving more than pumpkin, and today I offer you three pumpkin recipes: an appetizer, entrée, and dessert. 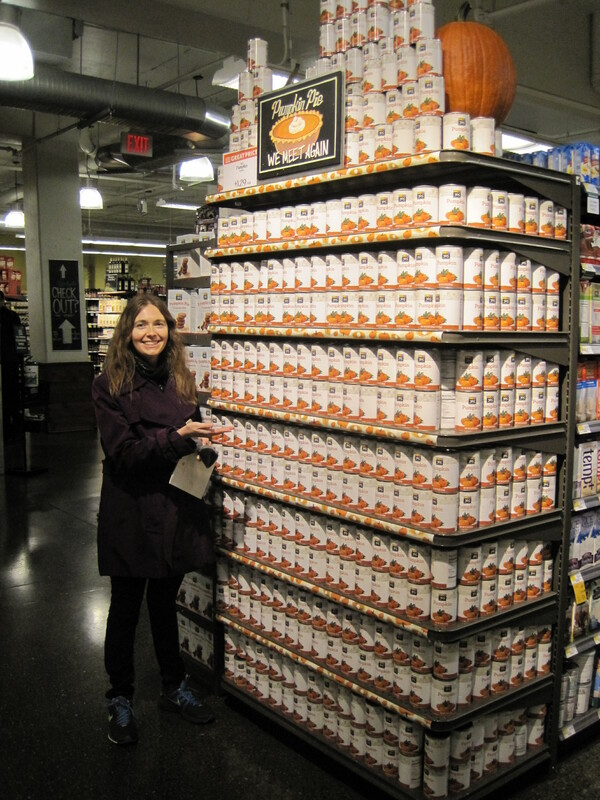 It’s a wonder wall at Whole Foods! Yum pumpkin. We know from archaeological digs that chickpeas, the main ingredient in hummus, date back to at least 7,500 B.C.E. Some historians credit this tiny legume, along with other primary crops, for enabling people in the Fertile Crescent to develop agriculture and, eventually, civilization through cities, armies, taxation, and government. Over time, chickpeas travelled across the globe. In Spain, they were called garbanzos. Indian dishes featured chana. In the Middle East, mashed chickpeas (called hummus in Arabic and Hebrew) were mixed with tahini (a sesame paste) to make hummus as we know it today. Hope you like this spin! Also perfect for your next Disney princess party! You cover both Jasmine and Cinderella with this one! Puree chickpeas in an immersion blender or food processer. Add remaining ingredients and blend until smooth and creamy. You may add more spices as desired. If hummus is too dense, add a splash of water. Alrighty, let’s move on to our main or side dish, Pumpkin Kugel. Kugel ( literally “ball” in Yiddish) is a type of pudding, usually containing a starch such as noodles, rice, matzah, or potatoes. While you may be most familiar with sweet noodle kugel, the casserole originated as a savory dish. In fact, kugel originated as a savory bread and flour based dumpling that was served in or alongside soup (same idea as matzah balls, or “knaidel”). During the early 13th century, German Jews began adding noodles to the dish. Kugel became especially popular in Chasidic Jewish households and study centers, where it was often viewed as a spiritual food to eat on Shabbat. When kugel arrived to America in the mid-nineteenth century with the influx of German Jews, its transformation continued. 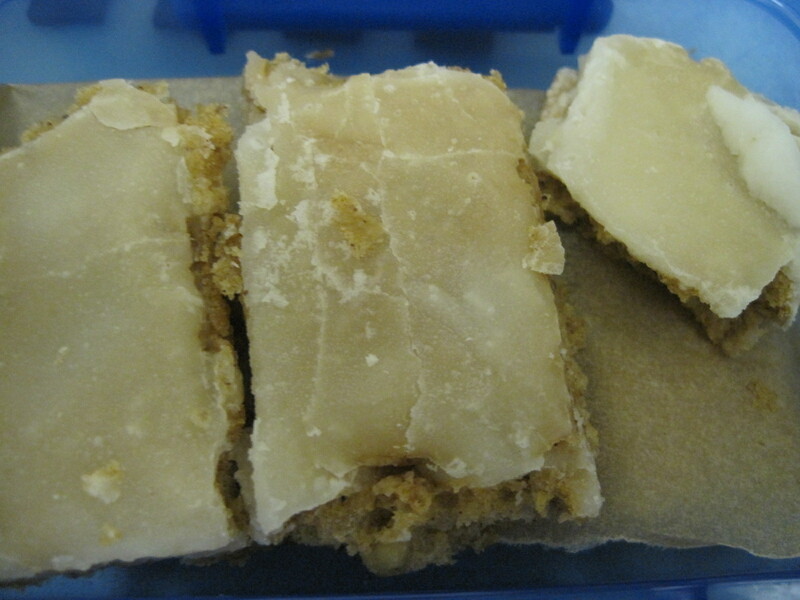 Sweet kugels benefitted from the addition of ingredients like cream cheese and cereal topping. Kugels are served at all sorts of Jewish holiday meals, including Hannukkah. 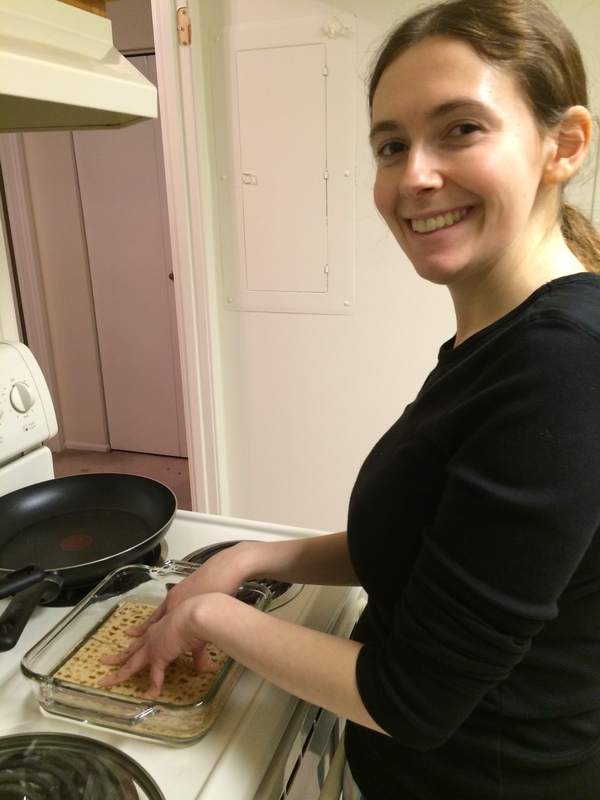 We got a jump start on latkes this year…and Becky made them for the first time! These latkes would also be good with the pumpkin hummus! One of my favorite kugels of all time is my mother’s savory spinach kugel, which I have used as the template for this pumpkin kugel. Hope you enjoy! Cook noodles according to directions, but leave al dente so noodles do not get mushy in oven. Strain and pour back into pot. Add butter, stir until melted. Add all remaining ingredients and mix. 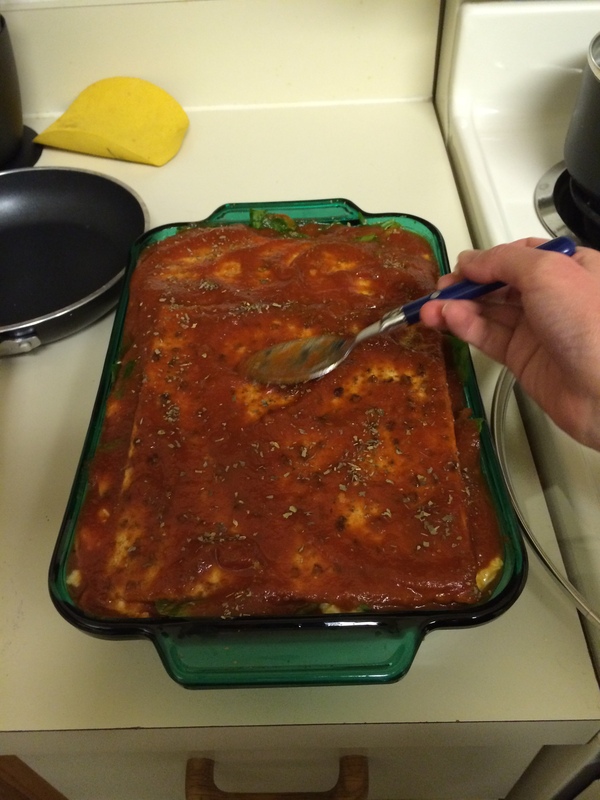 Pour into a greased 7×11 inch glass or casserole pan. 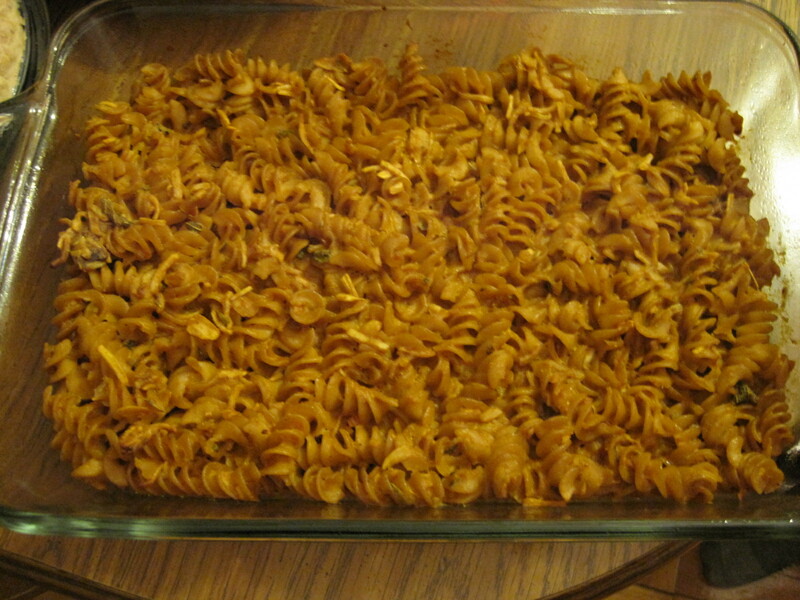 Cook at 350 degrees for 25-30 minutes, or until kugel is golden and noodles at top are crunchy. Nothing says Thanksgiving like pumpkin! We are finally ready for dessert! 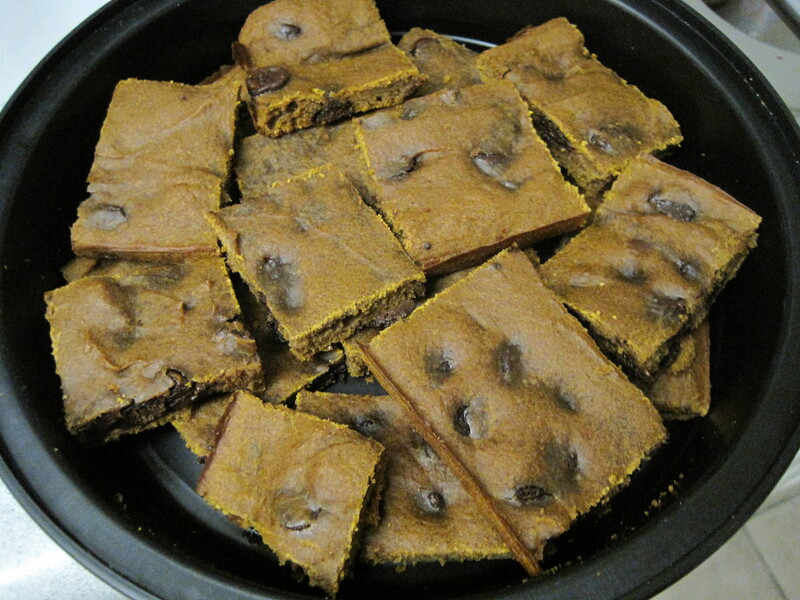 These pumpkin brownies are a hybrid of the chocolate chip cookie (see previous post) and pumpkin bread. They are delicious for breakfast and dessert. I’ve also included a sauce to pour on top if you wish! 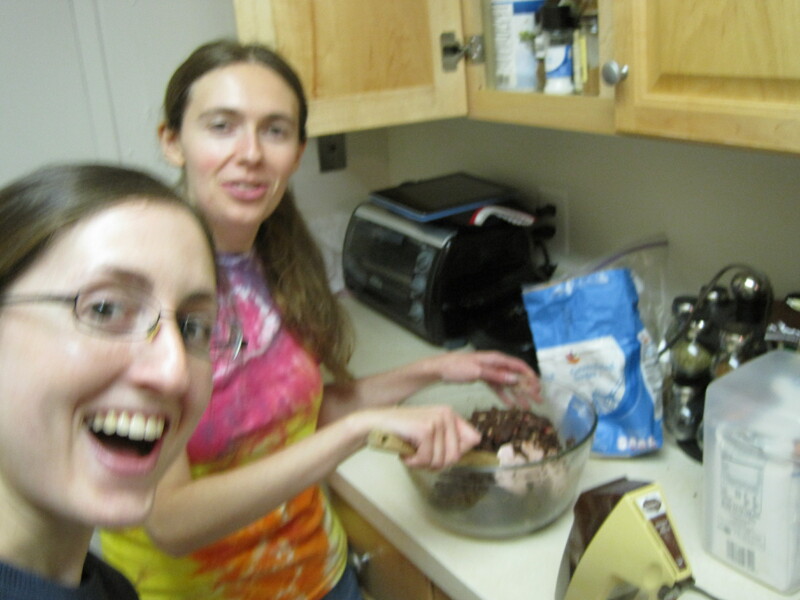 Apparently I was really happy about something…my guess is that I was sneaking chocolate chips. Shh! Combine dry ingredients in a large mixing bowl and set aside. Beat pumpkin, brown sugar, eggs, oil, and vanilla in another bowl. Gradually add the dry ingredients. Fold in chocolate chips. At least I saved some chocolate chips for the batter! Pour into a greased 7×11 baking pan and bake for 20-25 minutes, until toothpick comes out clean and top is golden. Allow to cool slightly before cutting into bars. Serve with vanilla ice cream and sauce (below). For the sauce: In a small saucepan, bring water to a boil. Add cranberries, stirring occasionally. 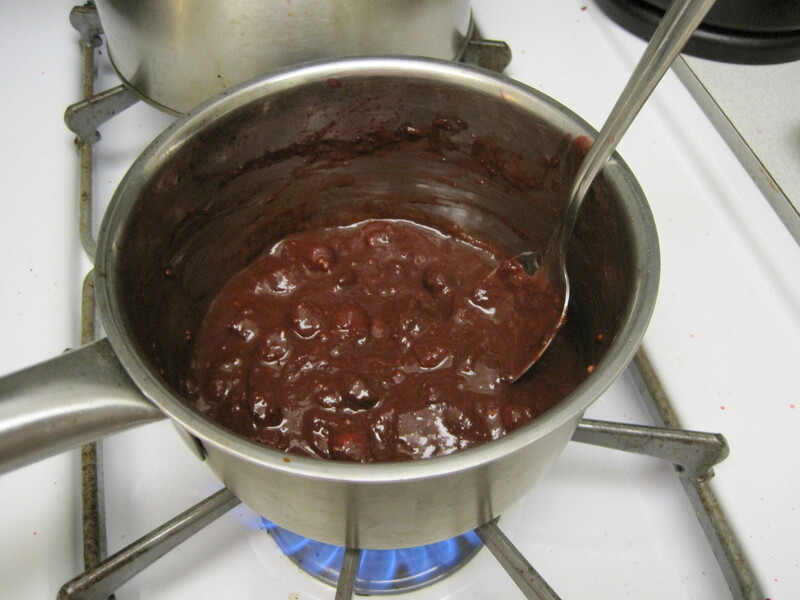 Once cranberries begin to liquefy, turn of heat and add the chocolate chips, which will melt. Add port and mix before serving. Happy Thanksgiving and Hannukkah to everyone! Diamond, Jared. Guns, Germs, And Steel. New York: Norton & Company, Inc, 1999. Nathan, Joan. Cooking in American. New York: Knopf, 1998. Smith, Andrew. “Pumpkins.” In The Oxford Companion to American Food and Drink, ed. Andrew Smith, 483-484. New York, Oxford University Press, 2007. Tuleja, Tad. “Pumpkins.” In Rooted in America: Foodlore of Popular Fruits and Vegetable, ed. David Scofield Wilson and Angus Kress Gillespie, 142-165. Nashville, University of Tennessee Press, 1999.